Update: As far as we can tell, the press release is not fake. While it’s not on TCBY’s site, it’s everywhere else in the media world including Bloomberg, Yahoo Finance, SmartBrief and MarketWire. It also includes media contact info. Obviously the photo is fake, but no one is claiming it to be real. Media info here. Update 2: We spoke with the media contact listed with the release and they’ve confirmed it as one big joke. So no, it’s not from the Onion and was TCBY just having some fun with Google. Definitely well played. 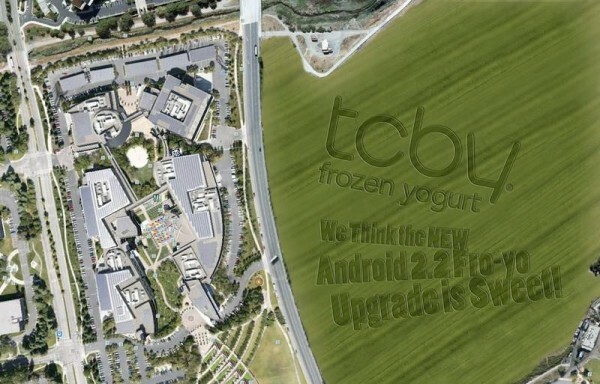 While I can’t remember the last time I ate frozen yogurt or at a TCBY, you can’t help but say, “TCBY frickin’ rocks!” after seeing the message they blasted in the grass across from Google’s campus. The frosty treat company was so excited for the release of Android 2.2 that they took their mowers to 300 acres and created “TCBY Frozen Yogurt… We Think the NEw Android 2.2 FroYo Upgrade is Sweet!” for the world to see. Well, on Google Earth anyway. Nice timing as Froyo for the Droid releases this week. Download it now!